1. Pestle & Mortar Pure Hyaluronic Serum - Could the packaging be any more perfect and chic? Maybe it was the understated clean aesthetic that initially drew me to this product, but what is in the bottle impressed me even more. A few pumps of this lightweight serum that absorbs instantly leaves my skin feeling like it has had an infusion of moisture. After only a few days of using, my skin looked plump and fresh and was able to maintain moisture levels longer throughout the day. I think this is a product that anyone can add into their routine because all skin types could benefit from more moisture. 2. Kypris Moonlight Catalyst - Buzz does not even begin to describe this brand and specifically this product. 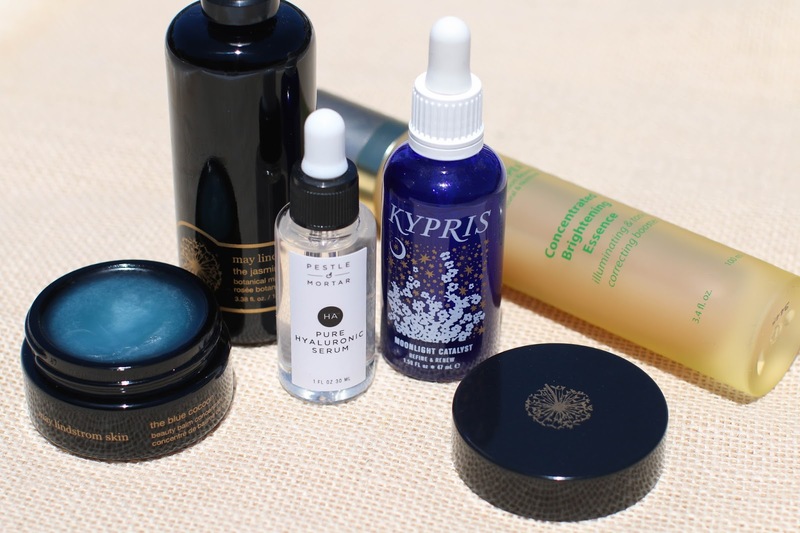 Kypris has been disrupting the skincare industry with their natural yet highly effective formulas. This particular serum has ingredients that perform much like retinol but are all natural in composition. The formula helps to regenerate the cells and boost turnover - which translated for me in gorgeous, glowy skin. I find that using this regularly helps reduce and heal any breakouts I may be having, while preventing future ones. I also experience smoother, more even toned skin - and less redness overall. It became a great all encompassing skin perfecting serum that targeted almost any and every concern I have. The only tip is that SPF must be worn during the day when using this regularly. No use in treating the skin with a great serum and then undoing it every day in the sun. 3. Tata Harper Concentrated Brightening Essence - Annnnnd the Tata Harper love affair continues. I have a few favorites from the line (this cleanser, this cleanser and this mask being my top 3), and this essence was another hit. While most of the essences in my collection target moisture levels and hydration, I enjoyed that this had the added benefit of brightening. The results were not instant, but more gradual and subtle. However, I am still using this every single morning and night and my usual hyperpigmentation I get on my forehead and hairline each summer is much less pronounced than ever before. While it may not be my strongest brightening or lightening product in my collection, it is something I have found to be helpful in an overall brightening skincare routine. I use it after I have cleansed and toned, but before I apply my serums. Patting it into my skin is my preferred method of applying essences, and no cotton is needed! 4. 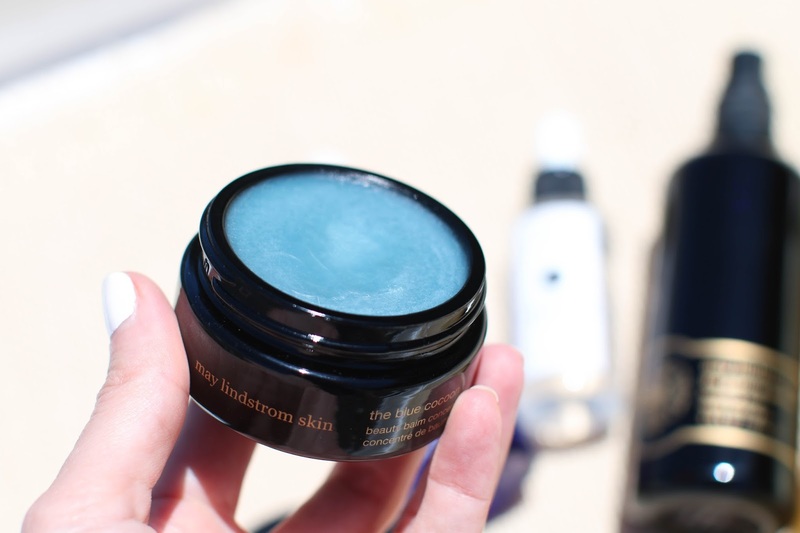 May Lindstrom The Blue Cocoon - If there was a hall of fame for natural skincare products, May Lindstrom would be one of the first inductees - I am sure of it. Her products are luxurious, pleasurable and effective. I have been eyeing this beauty balm ever since falling in love with this cleanser and this mask, and it was every bit the slice of skincare heaven I thought it would be. It's intensely rich, but surprisingly not greasy or suffocating on my oily skin. After playing around with it for a bit, I find that it works best for me when used alone after cleansing and toning. I love getting it on my bare skin and allowing all the oils to soothe and calm my skin. On the advice of May herself, I massage it in to very damp skin making sure to breathe in all of the aromatic scents (the whole process is almost ritualistic) and then apply a generous amount of the Jasmine Garden after to add in more moisture. I had my mom use it one night, and she woke up the next morning asking if I could scoop out a bit for her to have because her skin looked absolutely radiant! We have both been using it non-stop ever since. 5. 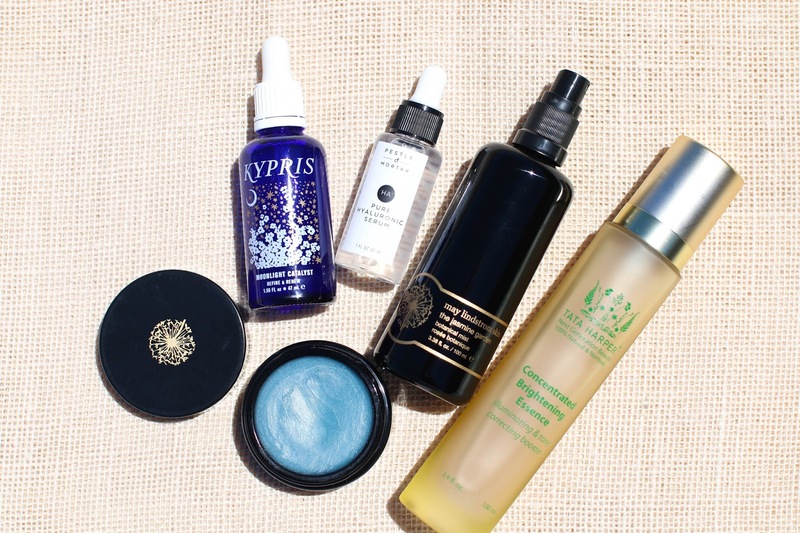 May Lindstrom The Jasmine Garden - If there is one thing that may seem nonessential in my skincare routine, but in fact is very essential are my face mists. I love using them after a nice acid toner/during the day/after a hydrating mask - frankly it is always a good time to mist in my opinion. I adore this particular one because of its soothing properties. Not only does my skin feel hydrated (duh - it's a mist after all LOL), but if anything is irritated or red it begins to calm after a few minutes of spraying this mist. And using it in conjunction with the Blue Cocoon is magic. What are some of your favorite natural skincare products? Leave me a comment below because I am always looking for new ones to try! Great to see this and you dipping into natural products! I always feel like that's the best route but have had no direction!